Always wanted to make your own website? Want to learn how to develop ideas you’ve designed? During Hackbright Academy’s 12-week Intro to Front-End Web Development night classes, you’ll be designing visual elements, telling interactive data stories and building a one-of-a-kind web application – all in the company of our supportive community. Or, new to programming? Join like-minded women interested in diving into the world of engineering at Hackbright Academy! Night classes makes it easy to integrate learning into your schedule Have you dabbled with code? Always wanted to make your own website? Want to learn how to develop ideas you’ve designed? 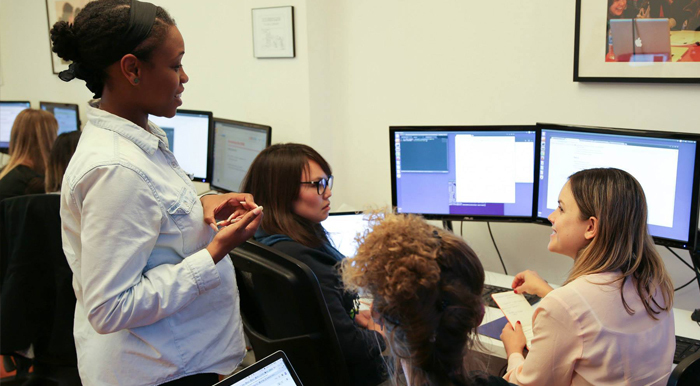 During Hackbright Academy’s 12-week Intro to Front-End Web Development night classes, you’ll be designing visual elements, telling interactive data stories and building a one-of-a-kind web application – all in the company of our supportive community. Are you completely new to programming and/or considering a career in software engineering? Learn one of the most important skills in today’s market to your resume – how to program! Start learning with Hackbright Academy’s 12-week Intro to Programming night classes the fundamentals of programming and software building. Join like-minded women interested in diving into the world of engineering this January 4th – learning from the Hackbright instructional staff below! Hadiyah Mujhid is a Senior Instructor for Hackbright Academy’s Intro to Front-End Web Development night class in San Francisco. Hadiyah is a recovering rocket scientist who now spends her days building software for startups and nonprofits through her consulting firm. 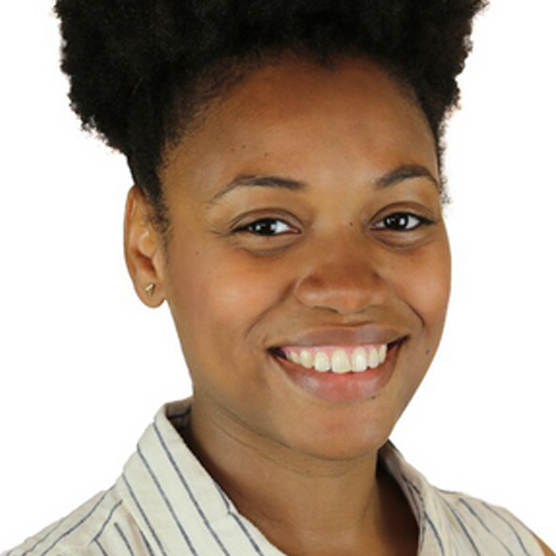 She co-founded the nonprofit Black Founders, an organization dedicated to encouraging and supporting black americans to pursue opportunities in tech entrepreneurship. 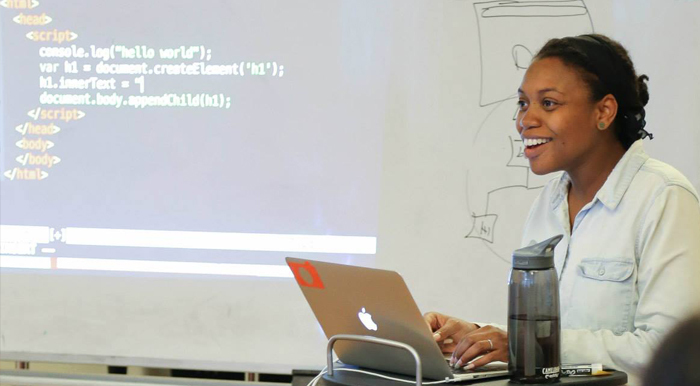 With 15 years developing software professionally, Hadiyah is always excited to help others learn the joys of coding. She holds a B.S. in Computer Science from University of Maryland Eastern Shore, and an MBA in Information Systems from Drexel University’s LeBow College of Business. 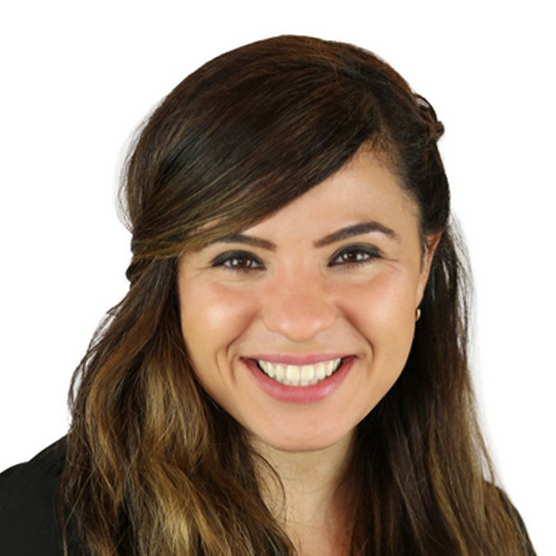 Nadine Farah is an Associate Instructor for Hackbright Academy’s Intro to Front-End Web Development night class in San Francisco. 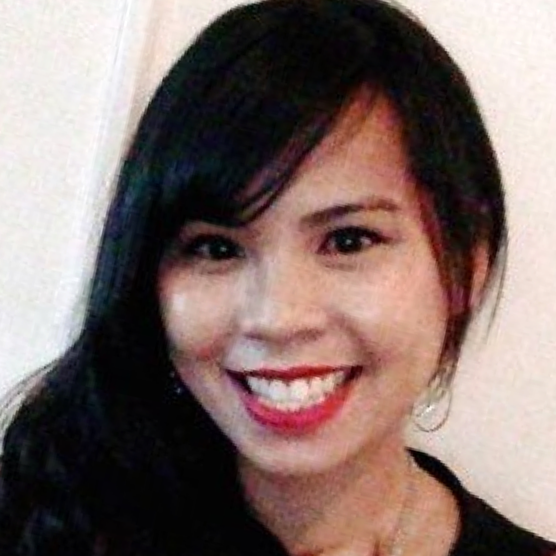 A Biochemistry and music nerd that was about to enter medical school, Nadine decided to transition into software engineering to help improve technology in the medical sector. Prior to teaching Hackbright, she attended Hackbright’s intensive 12 week engineering course. Shortly afterwards, she became a back-end engineer at Udemy working with data. During her free time she does crossfit, runs, and plays with her dog. She holds a B.S. in Biochemistry and Molecular Biology and Music Composition from Mills College. Silvia Gheorghita is a Teaching Assistant for Hackbright Academy’s Intro to Front-End Web Development night class in San Francisco. Silvia is a Hackbright alumna from Fall 2013 and is currently Software Engineer at Ripple, the awesome solution for global payments. Originally from Romania, she’s a networking geek and loves all things Python, the Terminal and basketball. She holds a B.A. in Communication, Computer Science and Photography from Wesleyan College. 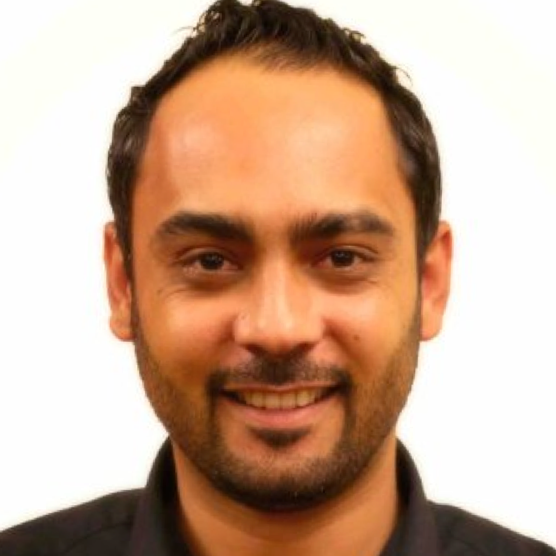 Ahmad Alawad is a Senior Instructor for Hackbright Academy’s Intro to Programming night class in San Francisco. He was most recently a Faculty Lecturer of Computer Science at Cal State University in Hayward. When he is not at Hackbright, you can find him in a cafe working on his own projects or hiking around lakes in Peninsula Area. He holds a B.S. in Computer Engineering from Jordan University of Science and Technology, and a M.S. in Computer Science from Cal State University in Hayward. 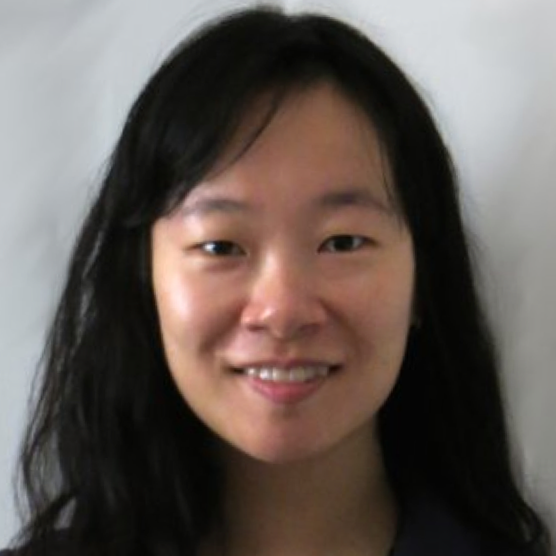 Diana Sheng is a Senior Instructor for Hackbright Academy’s Intro to Programming night class in San Francisco. Diana has over 12 years of software development experience in the financial industry building electronic trading systems. She started as a software engineer and became the CTO of Wolverine Execution Services. She also has over two years of teaching experience. When she isn’t programming, she is traveling the world, moonlighting as a chef, and spending time with her dog. She holds a B.S. in Mathematics and Computer Science from University of Illinois at Urbana-Champaign. Wes Modes is a Senior Instructor for Hackbright Academy’s Intro to Programming night class in San Francisco. Wes is a Santa Cruz artist and technologist. He has over 25 years of experience as an engineer, web developer, systems admin, and systems architect. His performance, sculpture, and social practice work has exhibited since 1996. In other lives, he is a writer, community organizer, geek, and mischief-maker. He holds a B.A. in Computer and Information Science, AI & Machine Learning from University of California, Santa Cruz. 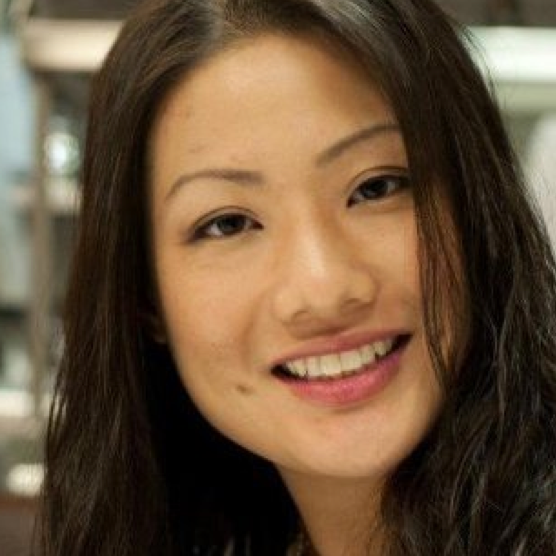 Amy Mok is an Associate Instructor for Hackbright Academy’s Intro to Programming night class in San Francisco. Amy is a software developer with a passion to use her skills for social good. She is currently working in Consumer Financial Protection Bureau to help consumer finance markets work for consumers. She has been a fellow with Code for America, using her technical skills to help city government foster a better interaction with their residents. Prior to her work with government, she built software to control satellites. While she is not coding, she enjoys learning as well as mentoring and coaching others. She holds a B.S. in Computer Science from the University of California at Berkeley, and a M.S. in Software Engineering from Carnegie Mellon University. 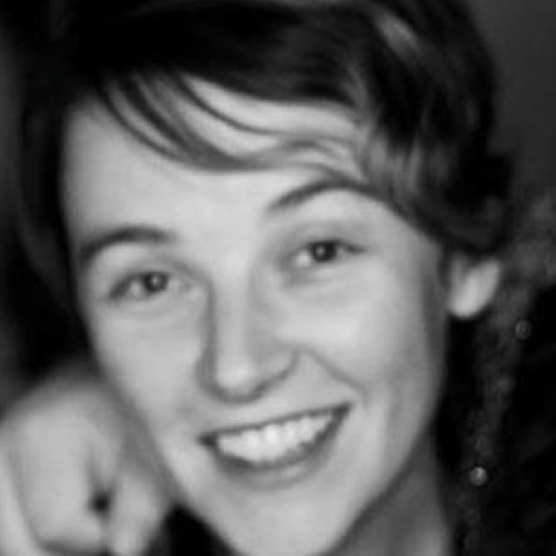 Jean Rintoul is an Associate Instructor for Hackbright Academy’s Intro to Programming night class in San Francisco. Jean is an entrepreneur with experience in numerous biosensor wearable start ups taking products from inception to launch, from Emotiv’s Brain Computer Interface to the Basis Biosensor wristwatch. Her work on neuroplasticity has been published through UCSF. Jean’s experience includes 15 years of algorithms for machine learning and image processing applications. She holds a B.S. in Physics and Mechatronic Engineering from the University of Sydney. 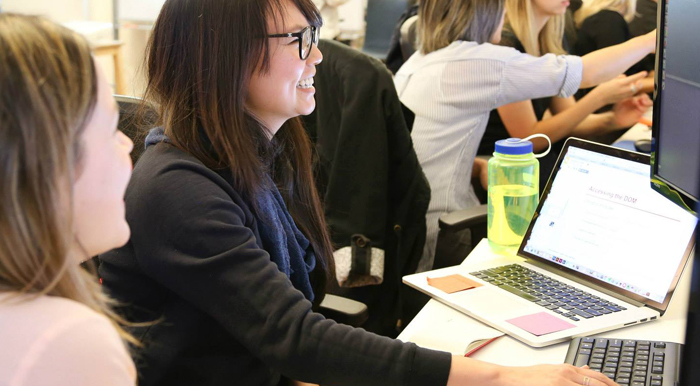 Karen Ho is an Associate Instructor for Hackbright Academy’s Intro to Programming night class in San Francisco. Karen is a full-stack engineer at Symphony Commerce. 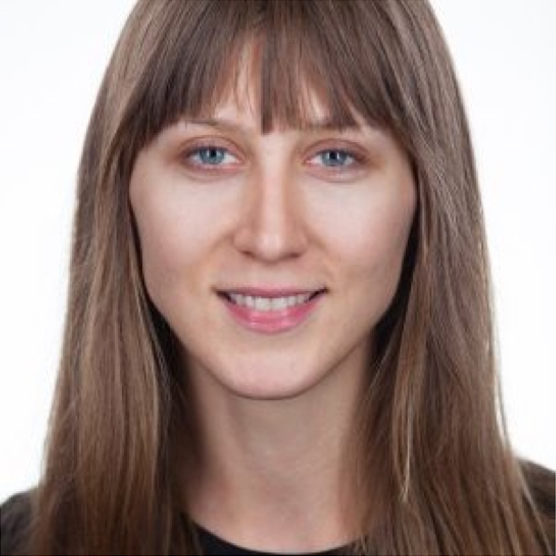 She has won a few award prizes from hackathons including TechCrunch Disrupt 2015. She is always working on a few programming side projects such as an animation website or (Beanstock) a portfolio tracking iOS app. In her spare time, Karen enjoys rock climbing at Dogpatch Boulders, biking up in the Marin or playing video games on her PC. She holds a B.S. in Material Science and Engineering and a M.S. in Computer Science, both from Cornell University. 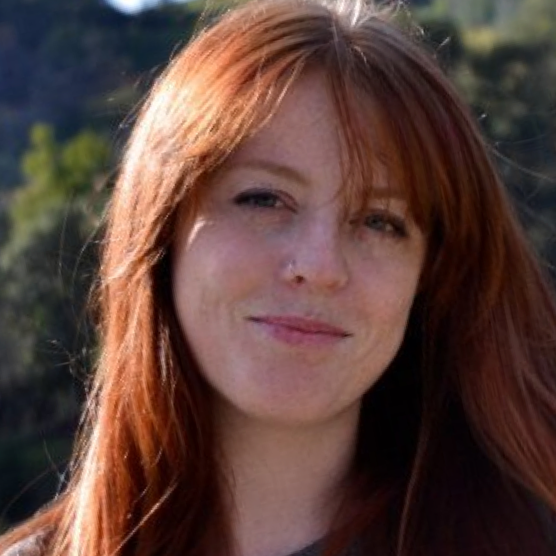 Lindsay Grizzard is a Teaching Assistant for Hackbright Academy’s Intro to Programming night class in San Francisco. Lindsay comes to Hackbright with a background in art history and fine arts. She became interested in software development after writing her senior undergraduate thesis on technology in the contemporary art world. She is passionate about art, design and technology and hopes to inspire other women from non-technical backgrounds to start programming. She holds a B.A. in Art History from Humboldt State University, and graduated from the Spring 2015 Hackbright engineering fellowship. Aaron Elligsen is a Teaching Assistant for Hackbright Academy’s Intro to Programming night class in San Francisco. Aaron is a software engineer at Rentlytics. 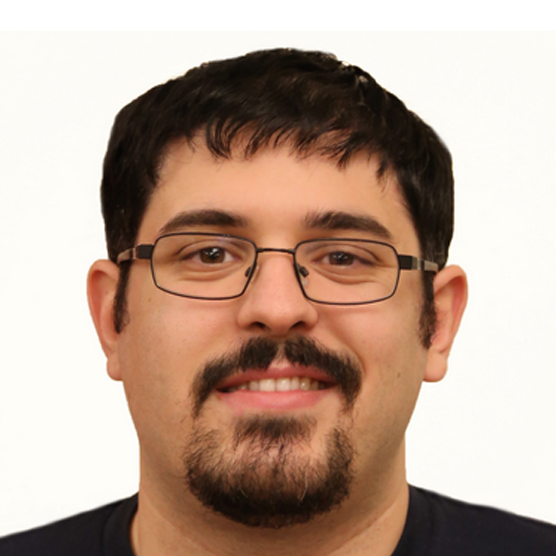 He learned his first programming language at age 12, and has been programming professionally for 9 years. 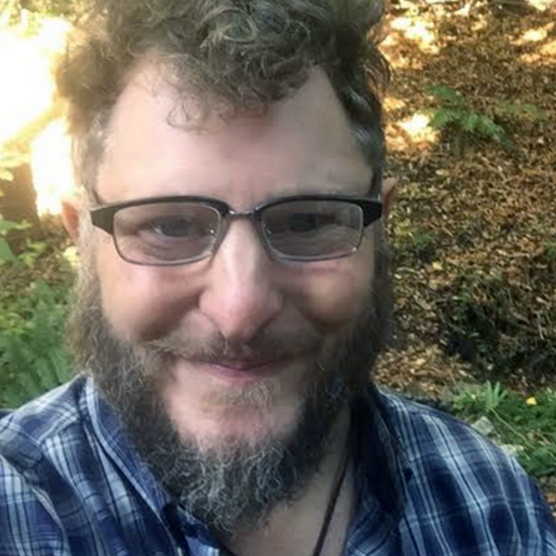 Some highlights of his software career include Oregon Research Institute, where he contributed to an online therapy and teaching platform for new mothers and mothers with postpartum depression, CreativeLIVE (an online live video education platform), and Nextstep Electronic Recycling (a non-profit). In his spare time, he enjoys anime, board games, mathematics, solving Rubik’s cubes, and pictures of cute animals. He holds a B.S. in Math with a minor in Computer Science from the University of Oregon. Learn more about our Intro to Front-End Web Development and Intro to Programming night classes for women. Classes start January 4, 2016 and enrollment ends January 1st so register soon for class!